Art cannot exist in a vacuum, independent, immune, and untouched by the innumerable facets and fluctuations of the world, for all art is created at a specific time and in a specific place. The artist, without exception, exists in a society with its own concerns, issues and goals, and it is these chronic yet changing problems that play a large part in the creation of new works. Whether due to war, famine, personal poverty, or forced relocation, each piece of music that we perform or listen to has its own context and purpose. We must wonder if much of the art that we now consider great would have been created at all, had it not been for the struggles that come with living in such an imperfect world. Perhaps the most poignant and radical example of this social-artistic reactivity was in the 20th century, when the abominations and mass destruction of World War II necessitated the creation of a new aesthetic to reflect the forever-changed and irreparably damaged global community. Artists of all types were forced to flee their respective countries and seek refuge elsewhere, many coming to North America to escape the dangers of the European continent. Stravinsky, Schoenberg and Hindemith are only a few of the significant composers who relocated to the United States, a career move that, far from being planned, was forced by external factors. While some musicians went less far afield, choosing to flee their homelands in favour of another European state, others involved themselves in the defense of their country by picking up arms, sometimes with tragic results. Jehan Alain, the French organist and composer, was killed in battle, and Olivier Messiaen was captured by the Germans and held as a prisoner of war. Messiaen wrote his Quatuor pour la fin du temps while in German captivity and it was first performed by his fellow prisoners; it has come to be recognized as one of his most important works. The deconstruction of music’s essential components through serialism was a significant and reactive measure to the postwar world, a highly ordered approach to composition that served as a juxtaposition to external chaos and is one of the most recognized movements of the postwar musical aesthetic. Renowned serial composer and conductor Pierre Boulez was perhaps the most outspoken advocate of music as a social and political vehicle, giving such memorable quotes as, “I assert that any musician who has not experienced – I do not say understood, but, in all exactness, experienced – the necessity for the dodecaphonic language is USELESS. For his whole work is irrelevant to the needs of his epoch … All the art of the past must be destroyed.” For artists who witnessed the destruction of their national histories and cultures with their own eyes, such sentiments likely seemed far less radical than they now appear. Although the discussion of serialism might seem strikingly modern within the context of an early music column, the sociopolitical catastrophes that precipitated serialism’s formation are not at all new. The Thirty Years’ War, for example, lasted from 1618 to 1648 and was one of the most destructive conflicts in human history resulting in eight million fatalities, not only from military engagements but also from violence, famine and plague. Conflict between the Catholics and Protestants created an unstable social environment, which resulted in a myriad of responses from composers and performers, including Heinrich Schütz. As Kapellmeister to the Elector of Saxony, Schütz had to provide music not only for standard liturgical ceremonies but also for special occasions, which was complicated by reduced performing forces as the war progressed. In fact, members of his church ensemble dropped one by one so that from 1632 to 1639 the number of members diminished by 29 people. Other composers were forced to flee the violence and disease or lost their positions as courts were eliminated or relocated, events that were to repeat themselves three centuries later as Europe’s nations once again took up arms against each other. An additional circumvention of tradition includes the casting of reversed-gender roles, with this performance featuring countertenor Ryan McDonald as Dido, Camille Rogers as Aeneas and Rebecca Genge as Belinda. While this may seem like a radical departure from Purcell’s original intention and scoring, this novel interpretation should maintain the integrity of the musical score as well as increasing its dramatic poignancy through a contemporary reimagining. Before Cor Unum and OperaQ combine to tackle Dido, Purcell’s music gets reconstructed by Confluence on April 5 and 6. “‘Tis Nature’s Voice: Henry Purcell Reimagined” features arrangements of vocal works by Purcell performed by an extended roster including Anne Atkinson, Larry Beckwith, Andrew Downing, Drew Jurecka, John Millard, Patricia O’Callaghan, Gregory Oh, Alex Samaras and Suba Sankaran. The most renowned arrangements of Purcell’s vocal music were done by Benjamin Britten, whose deliberately pianistic realizations of figured bass launch this harpsichord-based 17th-century music into the piano-focused 20th century. For this concert, however, Confluence associates Patricia O’Callaghan and Andrew Downing bring together some of Toronto’s finest composer-musicians to rearrange and perform the music of Henry Purcell. It will be most interesting to hear their perspectives on Purcell’s songs, which run from the simple to the sublime and everything in between. Renowned for both their musical finesse and social awareness through novel multimedia presentations, Tafelmusik goes small-scale on April 10 with Strangers in Strange Lands, part of their Close Encounters chamber series. Presented in smaller venues across the city, these concerts are a wonderful opportunity to get an up-close look at the performers that make Tafelmusik the ensemble it is; this session features Marco Cera, Julia Wedman, Patrick G. Jordan, Allen Whear and Charlotte Nediger as they explore music in the galant style. The galant style was short-lived, bridging the Baroque era with the classical, but it nonetheless featured some fine musicians and their works: C.P.E. and J.C. Bach, Quantz, Hasse, Sammartini, Tartini, Alberti and early Mozart are all exemplars of galant style, which simplified the contrapuntal density of the Baroque and introduced more melody-driven features. Even Haydn was influenced by this melody-based movement, reportedly commenting, “If you want to know whether a melody is really beautiful, sing it without accompaniment.” With such fine musicians performing such delightful repertoire, beautiful melodies will undoubtedly abound, both with accompaniment and without! No matter how charming or innocuous a piece of music may seem, there is inevitably a story behind it. Whether written during or because of war, as a lifeline during a period of personal financial hardship, or as part of an application for a position or promotion, it is remiss of us to extract our art from its historical context. While it may be overly idealistic to apply to all works, the hearing of certain pieces such as Britten’s War Requiem, Penderecki’s Threnody or Howells’ Hymnus Paradisi can serve as reminders of historical and personal landmarks. It is also possible, as we see this month, to adapt and reinterpret old music in new ways, increasing its relevance to the modern audience member. Regardless of whether you prefer old music or new, I encourage you to listen with open ears and an informed mind. Get in touch if you have any questions or want some more context on what’s happening this month: earlymusic@thewholenote.com. APR 6, 8PM: Scaramella presents “Red Priest” at Victoria College Chapel, 91 Charles St. W. Despite being one of Italy’s greatest Baroque composers, Antonio Vivaldi’s vocal music is still underperformed. Don’t miss this opportunity to hear a selection of his mini-masterpiece chamber cantatas featuring countertenor Daniel Cabena. APR 27, 8PM: Rezonance Baroque Ensemble presents “Harpsichord Explosion” at St. Barnabas Anglican Church, 361 Danforth Ave. Two words: Harpsichord. Explosion. Have you ever seen a harpsichord explode? Neither have I. MAY 4, 7:30PM: Isabel Bader Centre for the Performing Arts presents “Baroque and Beyond: Bach and His World.” 390 King Street West, Kingston. Conceived, scripted and programmed by Alison Mackay, this multimedia presentation is sure to entertain and inform, and features works by one of the greatest musical minds in history. The Baroque era was a time of international cultural exchange and groundbreaking creativity. Composers from across Europe brought music from the last vestiges of Renaissance modality to the systematic hierarchy of tones and semitones as defined by functional harmony. If there is one composer whose name is synonymous with the Baroque era and its developments, it is most likely Johann Sebastian Bach. Bach was an inherently paradoxical figure, practical yet prickly, pious yet prideful, conservative yet radically progressive, a musical visionary with one foot in the past. We need look no further than the B-Minor Mass to see Bach’s equal comfort in the old modal style and a new, highly chromatic tonal system, evident in the contrast between the Credo fugue, based on cantus-firmus models of earlier times, and the comparatively shocking Crucifixus. The latter is an extended exploration of semitone relationships and enharmonic modulation masquerading as a ground-bass chaconne, using harmonic techniques that would not become frequently and fluently exercised until almost a century later. Defence of Bach’s placement among the greats in the pantheon of musical history, is superfluous and unnecessary. The preceding paragraphs simply attempt to illustrate just how significant the contributions of this one composer are. To look at Bach’s music from another perspective, we can ask ourselves why Glenn Gould’s 1955 recording of the Goldberg Variations is one of the bestselling Classical albums of all time. (Before this recording, after all, the Goldbergs were considered museum pieces, old stuck-up essays in variation form that were unworthy of public performance.) The answer, most likely, is that, in the hands of someone who truly understands its intricacies and is able to express them, Bach’s music is the ideal repertoire to perform, challenging the interpreter and the listener and creating an atmosphere that borders on the sublime. No two live performances of the same work are ever identical, but this is all the more so with Bach, whose music is conducive to elastic and creative interpretations; a performer can adopt and adapt, making them endlessly subjective – and thereby communicative – experiences for an audience. In case this extended preamble wasn’t a sufficiently obvious lead-in, March is full of Bach’s music, performed across Southern Ontario by a variety of ensembles. On March 21 to 24 in Trinity-St. Paul’s Centre, Tafelmusik presents a much-anticipated performance of the Matthäus-Passion (St Matthew Passion), led by Japanese conductor Masaaki Suzuki. Suzuki is a Japanese organist, harpsichordist and conductor, and the founder and musical director of the Bach Collegium Japan, with which he is recording the complete choral works of Johann Sebastian Bach. To give a brief overview of Suzuki’s output to date, Bach Collegium Japan completed their 55-volume series of Bach’s church cantatas in 2013, the secular cantatas in 2018, as well as all of Bach’s Lutheran Masses, motets, and large choral works. Suzuki is also recording Bach’s concertos, orchestral suites and solo works for harpsichord and organ, as well as guest conducting with ensembles around the globe. The St. Matthew Passion is a monumental work for vocal soloists, two choirs, and two orchestras, and Bach’s largest single piece of music, running almost three hours in an average performance. Containing some of Bach’s most beautiful and exquisitely crafted material, the St Matthew Passion was first performed on Good Friday 1727 at the St. Thomas Church (Thomaskirche) in Leipzig. One of the challenges of performing this work involves the distribution of forces within the performing space; how does one ensure that the division of the large choir and orchestra into two distinct parts is clear and apparent, particularly in such essentially antiphonal movements as the opening “Kommt, ihr Töchter, helft mir klagen”? In Bach’s time St. Thomas Church had two organ lofts: the large organ loft that was used throughout the year for musicians performing in Sunday services, and the small organ loft, situated at the opposite side of the sanctuary, that was used additionally in the grand services for Christmas and Easter. The St. Matthew Passion was composed so that a single work could be performed from both organ lofts at the same time: Chorus and orchestra I would occupy the large organ loft, and Chorus and orchestra II performed from the small organ loft. In a space lacking these vehicles for spatial separation, it will be fascinating to see how the dynamism of Bach’s score is realized onstage in this don’t-miss performance of Tafelmusik’s 40th-anniversary season. A short drive away in Oakville, the Oakville Chamber Orchestra celebrates their 35th anniversary with a complete performance of Bach’s Brandenburg Concertos. Regarded as some of the best orchestral compositions of the Baroque era, this collection of six instrumental works was presented by Bach to Christian Ludwig, Margrave of Brandenburg-Schwedt, in 1721. While Bach took the opportunity to revise the concerti before presenting the scores to the margrave, each copied in his own hand rather than by a copyist, the material itself was likely not freshly composed, but rather selected from concertos he had composed over a number of years while at Köthen, and possibly extending back to his employment at Weimar. After their gifting to the margrave, the Brandenburgs had a rather unfortunate history: because King Frederick William I of Prussia was not a significant patron of the arts, Christian Ludwig lacked the musicians in his Berlin ensemble to perform the concertos. The full score was left unused in the Margrave’s library until his death in 1734, when it was sold. The autograph manuscript of the concertos was only rediscovered in the archives of Brandenburg in 1849 and published in the following year. While Bach undoubtedly led performances of the original movements as Kapellmeister at Köthen, he never heard a performance of the Brandenburg Concertos as we now know them. Fortunately, such opportunities are not lost on the modern concertgoer, though it is a rare treat to be able to hear all six works in one performance. Each concerto has a unique character and body of soloists, the fifth concerto perhaps the most renowned for its extraordinary harpsichord part. (It seems very likely that Bach, considered a great organ and harpsichord virtuoso, was the harpsichord soloist at the premiere of an earlier version in Köthen). Modern interpretations of these pieces range from one-to-a-part chamber ensembles of period instruments to pared-down symphony orchestras on modern instruments; regardless of the forces involved, these masterpieces are essential listening for fans of early music and worth exploring by anyone who appreciates Bach’s instrumental works. Known now as a brilliant composer of vocal and instrumental works, Bach was more renowned in his time as an improviser, keyboard virtuoso and organ consultant. (Whenever he tried a new organ, Bach’s practice was to start off by playing with all the stops pulled out, with every rank of pipes sounding at once. In this way, he said, he could see what kind of “lungs” an instrument had.) Bach famously displayed his skill at extemporization in front of King Frederick II of Prussia at Potsdam in May 1747, when the king played a theme for Bach and challenged him to improvise a fugue based on his theme. Bach obliged, playing a three-part fugue on one of Frederick’s fortepianos, before reworking the King’s theme into the Musical Offering. On April 6, Rezonance Baroque Ensemble and Musicians on the Edge explore Bach’s improvisatory skill through their concert “The Bach Family and the Improvising Tradition” at Metropolitan United Church. The Bach family was an imposingly gifted family, producing generations of musicians of the highest calibre, and it will undoubtedly be a compelling experience as the audience is introduced to the largely lost art of extemporization. There may even be a fugue or two, made up on the spot! While this month’s column is devoted to one of the greatest composers in the history of Western music, there are many other great composers represented within the pages of this magazine who you are encouraged to explore. As we slowly thaw after another Canadian winter and the days grow longer, it is the perfect time to get outside, go to concerts, and see what the world looks like underneath all that snow and ice! In the meantime, contact me with any questions or comments at earlymusic@thewholenote.com. MAR 9, 7:30 PM: Theatre of Early Music. Israel in Egypt. St. Patrick’s Church, 131 McCaul Street. Not only was Handel born in 1685, the same year as Bach – he wrote some pretty good tunes too! Don’t miss this extraordinary oratorio full of dramatic story and magnificent music. MAR 27, 7:30 PM: Julliard415. “Baroque and Beyond: Bach and Vivaldi.” Isabel Bader Centre for the Performing Arts, 390 King Street West, Kingston. Violinist Rachel Podger and the Juilliard415 Baroque ensemble visit Canada to perform works by two masters of chamber music. (Bach was quite familiar with Vivaldi’s output and even transcribed a number of concerti for the organ.) Ideal music for an absolutely stellar concert hall. History’s pruning shears are aggressively pragmatic, trimming away that which is not tremendously noteworthy, revolutionary, famous or infamous. Music history is no kinder to its members, the pantheon of perpetual fame reserved for those select few on whom we bestow the title of “genius.” In the movie Amadeus, which, by the way, is screening with live orchestra at the Sony Centre February 21 and 22, court composer Antonio Salieri “speak[s] for all mediocrities in the world. I am their champion. I am their patron saint.” He fully expects to be expunged from the record books because of his lack of prodigious talent, surpassed in every way by the young and inexplicably, divinely gifted Wolfgang Amadeus Mozart. Almost as well-known as Amadeus itself is the understanding that (spoiler alert!) the vast majority of the drama in the film is entirely fictitious. Salieri did, in fact, achieve great success during his career, not only dominating Italian-language Viennese opera, but also becoming one of the most important and sought-after teachers of his generation, with such pupils as Franz Liszt, Franz Schubert, and Ludwig van Beethoven… not too bad for the “patron saint of mediocrities.” But while this particular instance of historical pruning may be false, there are many other examples of how time can act as an eraser, gradually wiping away traces of people, places, and events. Let us consider, for example, the idea of national “schools” of music, which ebb and flow depending on the time period and corresponding socio-political circumstances of each country. Throughout the history of music there are three countries which consistently contributed to the development of European music from the medieval era to the 20th century: Germany, France and Italy; these nations produced some of the great composers of the past, including Bach and Beethoven, Couperin and Debussy, and Vivaldi and Puccini, respectively, as well as virtuoso interpreters. England has made valid contributions throughout history as well, particularly in the Renaissance and Baroque, with the Tudors and later composers such as Purcell, and in the late 19th and early 20th centuries through Parry, Elgar, Howells, Britten and others. On February 21, Gallery 345 presents harpsichordist Corina Marti, playing keyboard music from 16th-century Poland. Poland’s influence on classical music cannot be underestimated, with world-famous composers such as Frédéric Chopin, Witold Lutosławski, Krzysztof Penderecki, Karol Szymanowski and Henryk Górecki, and renowned pianists like Arthur Rubinstein, Ignacy Jan Paderewski and Krystian Zimerman counted amongst its artistic elite. While these composers and performers are largely from the 19th and 20th centuries, Poland has had a national musical identity since the 13th century, from which manuscripts have been found containing polyphonic compositions related to the Parisian Notre Dame School. During the 16th century, two musical ensembles led a rapid development in Polish music – both were based in Kraków and belonged to the King and Archbishop of Wawel. Music does not exist in a vacuum, however, and a number of Italian musicians were guests at the royal courts in the early 17th century, included Luca Marenzio, Giovanni Francesco Anerio, and Marco Scacchi. During the 17th century, Polish composers from this period focused on Baroque religious music and concertos for voices, instruments and basso continuo, a tradition that continued into the 18th century. This concert is certainly worth exploring, in part because it provides more questions than answers: what will this Renaissance-era music from Eastern Europe sound like? Will it resemble the Tudor school and the pavanes and galliards of Byrd and Gibbons, or perhaps the more fantastical style of Frescobaldi? There is only one way to find out! Another country that has not received significant recognition for its musical contributions is Spain where, particularly in the renaissance, creativity and experimentation abounded. The Toronto Chamber Choir delves into repertoire from mediaeval and renaissance Spain with their concert “Convivencia: Music Across Three Faiths” on March 2. Featuring Sephardic folk songs, classical Arabic melodies, and Spanish polyphony, this performance captures the cross-pollination that took place in a country with an unusually rich and complex musical and political history. Over the course of its history, Spain has had more than 2,000 years of internal and external influences and developments that have combined to produce a large number of unique musical traditions, closely related to changing political climates. In the two centuries before the Christian era, Roman rule brought with it the music and ideas of Ancient Greece. Early Christians, who had their own differing versions of church music, arrived during the height of the Roman Empire, while the Visigoths, a Romanized Germanic people, took control of the peninsula following the fall of the Roman Empire. The rule of Moors and Jews in the Middle Ages added another influence to the musical climate, and the style of Spanish popular songs of the time is presumed to have been heavily influenced by the music of the Moors. By the early 16th century, the polyphonic vocal style that developed in Spain was closely related to that of the Franco-Flemish composers. Composers from the North of Europe visited Spain, and native Spaniards travelled within the Holy Roman Empire, which extended to the Netherlands, Germany and Italy. Tomás Luis de Victoria, for example, spent a significant portion of his career in Rome, developing a technique that was said to have reached a level of polyphonic perfection and expressive intensity equal, or even superior, to Palestrina and Lassus. By blending Sephardic, Arabic and Spanish musics, the Toronto Chamber Choir’s Convivencia will provide an artistic reflection of the real-world exchanges that took place between the world’s three great monotheistic religions in a country whose history is punctuated by fascinating and wide-reaching influences. Featuring Lucas Harris as conductor and lutenist, as well as guest singers, guitars, oud, ney and percussion, this concert is ideal for those who wish to broaden their knowledge of classical music and get a big-picture look at what influenced the music we hear and perform today. While on the topic of big-picture performances, Tafelmusik will remount their successful multimedia production “Tales of Two Cities: The Leipzig-Damascus Coffee House” from February 21 to 24. Conceived, scripted and programmed by Alison Mackay, this musical exploration of the links between 18th-century Saxony and Syria became one of the most talked-about projects in Tafelmusik’s history when it was first seen in 2016. 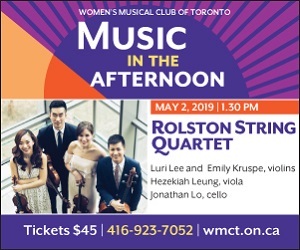 Celebrating the rich musical traditions of East and West, and the renewed dialogue between those traditions in contemporary, multicultural Toronto, Tales blurs musical boundaries and alters our perspectives on musical history. In terms of artistry, this concert brings an all-star roster to the Koerner Hall stage, featuring the Tafelmusik orchestra led by Elisa Citterio and Opera Atelier’s Marshall Pynkoski as stage director. The Tafelmusik team will be joined on stage by Maryem Tollar, vocalist and co-narrator, Alon Nashman, co-narrator, Naghmeh Farahmand, percussion, and Demetri Petsalakis, oud. In case you missed it in 2016, the musical selections are stellar, and include canonic works by Bach, Handel, Telemann and more, as well as traditional Arabic song and klezmer fiddle music. Have questions about these or any other early music concerts in this month’s WholeNote? Get in touch at earlymusic@thewholenote.com. FEB 3, 2PM: Rezonance Baroque Ensemble. “Italian Celebration.” St. Barnabas Anglican Church, 361 Danforth Ave. Old and new come together as folk music and compositions by Neapolitan Baroque composers are performed alongside works by Toronto composer Romina di Gasbarro. FEB 15, 8PM: St. Basil’s Church, University of St. Michael’s College. “Litanies de la Vièrge.” St. Basil’s Church, 50 St. Joseph St. Glorious music from the pinnacle of the French Baroque, with choir and organ music by Charpentier, de Grigny and Couperin. FEB 16, 7:30PM: St. George’s Cathedral. “Te Deum Laudamus.” St. George’s Cathedral, 270 King St. E, Kingston. A survey of music from England and anthems from the 17th to 20th centuries, including Handel’s Te Deum in D and Stanford’s stunning Te Deum in B-flat. National identity and culture play a profound and vital role in the artistic self-perception of a country’s performers and composers. Looking back on the Renaissance and Baroque eras, it is clear that unique combinations of pedagogy, performance practice, politics and technique led to the development of identifiable national schools, particularly in France, Germany, Italy and England. These schools are where we see the development of such localized phenomena as the polyphony of Tudor England, the chorale-based compositions of Lutheran Germany, and the development of Italian operatic and dramatic forms. The annual arrival of Christmas brings with it a host of music from across Europe, connected through various forms of Christianity, but unique in individual flavours and styles. Last month we were introduced to the villancicos navideños, an ebullient form of proto-popular Christmas music native to Spain; this December and January we are fortunate to hear a wide range of music from other cultural hotspots, performed by some of our city’s finest ensembles. No name is more synonymous with the German Baroque than Johann Sebastian Bach, whose choral compositions combined Lutheran theology with divinely inspired music. Bach’s Christmas Oratorio is a classic Christmas composition from the Baroque era, compiled and composed between 1733 and 1734 to celebrate the Christmas season in Leipzig. Although considered a single, freestanding work (catalogued as BWV 248) this “oratorio” is a series of six individual cantatas that were performed during the time between Christmas and Epiphany and divided between the Thomaskirche and Nikolaikirche. Monumental in scope and brilliant in its musical expression of Bach’s beliefs and theology, the Christmas Oratorio is, along with the Passions, the closest Bach came to writing a dramatic work. The Toronto Classical Singers tackle this incredible work on December 9, bringing a touch of variety to an oratorio scene saturated with performances of Handel’s Messiah! About 100 years before Bach was born, Michael Praetorius was pioneering new musical forms in the Lutheran tradition, developing and incorporating Protestant hymnody into freely composed pieces, such as the chorale fantasias for organ. Praetorius was prolific, his voluminous output showing the influence of Italian composers and his younger contemporary Heinrich Schütz. His works include the nine volume Musae Sioniae (composed between 1605 and 1610), a collection comprised of more than 1200 chorale and song arrangements, and Terpsichore, a compendium of more than 300 instrumental dances, which is both his most widely known work and his sole surviving secular work. Now known almost exclusively for his harmonization of Es ist ein Ros entsprungen, made famous in the Carols for Choirs collection, a broader overview of Praetorius’s music will be on display December 14 to 16 with The Toronto Consort’s Praetorious Christmas Vespers, a reproduction of a Christmas Vespers as it might have sounded in the early 17th century. It is worth remembering that there were many generations of composers who paved the path for the great composers of the late baroque, and the chance to hear the unique sounds of these earlier soundsmiths is certainly valuable and rewarding. François Couperin (1668 - 1733), known by his contemporaries as Couperin le Grand (Couperin the Great), was born into one of the most renowned musical families in Europe, the French equivalent of the German Bachs. Couperin was a prolific and influential composer, receiving a 20-year royal publishing privilege in 1713 and subsequently issuing numerous volumes of keyboard and chamber music including his most famous book, L’Art de toucher le clavecin. Unlike other Baroque composers whose works were lost and later revived, Couperin’s have remained in the repertory; Johannes Brahms performed Couperin’s music in public and contributed to the first complete edition of Couperin’s Pièces de clavecin by Friedrich Chrysander in the 1880s; Richard Strauss orchestrated a number of Couperin’s harpsichord pieces; and Maurice Ravel memorialized his fellow French composer in his Le Tombeau de Couperin. On December 15, Ensemble Masques visits the University Club of Toronto Library to celebrate the 350th anniversary of Couperin’s birth with a commemorative concert featuring the music of Couperin, Lully and Corelli. While the inclusion of an Italian in this French-themed concert might seem strange, Corelli was tremendously influential to Couperin. Couperin himself acknowledged this debt to Corelli, introducing Corelli’s trio sonata form to France through his grand trio sonata Le Parnasse, ou L’Apothéose de Corelli (Parnassus, or the Apotheosis of Corelli), in which he blended the Italian and French styles of music in a set of pieces which he called Les Goûts réunis (styles reunited). With selections from Couperin’s Concerts Royaux, Pièces de Clavecin, and Nouveaux Concerts et Pièces de Violes, this concert will provide an overview of the great composer’s works, expertly interpreted by harpsichordist Olivier Fortin, violinist Kathleen Kajioka and gambist Mélisande Corriveau. Despite the challenging and potentially lethal political situations that occurred during the reigns of Henry VIII and Elizabeth I, the composers of Tudor England created some of the most sublime choral music ever written. Whether Catholic or Protestant, in English or in Latin, the music of William Byrd, Thomas Tallis, Orlando Gibbons and their contemporaries underwent a well-deserved revival in the 20th century and continues to be popular in churches and concert halls across the globe. Pax Christi Chorale, an ensemble known for their performances of large-scale dramatic oratorios, lend their voices to some smaller-scale, a cappella masterpieces from the English Renaissance on December 16. With Byrd’s Mass for Five Voices and anthems by Tallis, Weekes and Gibbons, this exploration of Tudor polyphony will undoubtedly be beautiful and, depending on the size and finesse of the ensemble, likely more aligned with the massed-choir sound of King’s College, Cambridge than the streamlined timbres of the Tallis Scholars. Cera, who plays the role of Ghezzi in The Harlequin Salon, is an artist as well; he studied figurative art at Liceo Artistico Citta’ di Valdagno in Italy before joining Tafelmusik in 2000. The Harlequin Salon’s recreation of one of Ghezzi’s famous salon evenings will undoubtedly be entertaining, giving audiences a chance to travel back in time and imagine what happens (and what music results) when these famous characters from the past cross paths. Famous guests at this salon include composer Antonio Vivaldi, 24-year-old opera diva Faustina Bordoni, and cello virtuoso Giovanni Bononcini. These guests and their music will be performed by Tafelmusik’s music director Elisa Citterio, guest soprano Roberta Invernizzi and Tafelmusik cellist Christina Mahler, making this new concert a don’t-miss event, January 16 to 20. Now in their third full season, Cor Unum Ensemble is one of Toronto’s newest early music ensembles, an orchestra and chorus comprised of emerging professionals interested in vocal and instrumental collaboration within the early music repertoire. On December 8 and 9, Cor Unum presents “Merry & Bright,” a collection of seasonal music from across Europe, followed by “Sub Rosa” on January 26 and 27. Sub Rosa, a collaboration between Cor Unum and the Sub Rosa Ensemble, explores 16th- and 17th-century repertoire written for and by cloistered nuns who, although often highly trained, are rarely considered in the context of music history. These nuns used singing and composition to communicate their identity and their devotion beyond the convent walls, developing their social and financial independence, and their music will be used to explore the important role played by women in the early Baroque musical scene. “Centuries of Souls,” presented by Confluence on January 26, promises to be one of January’s most interesting concerts. Featuring Opus8 singing Ockeghem’s famous Requiem mass, Matthew Larkin playing Messiaen organ works, and Schola Magdalena singing Hildegard, this performance stretches across five centuries of musical history. Messiaen and Hildegard are, although separated by a great temporal distance, closely connected through their mysticism. Hildegard experienced visions and expressed them through tune and text, while Messiaen expressed the mysteries of his devoutly held Catholic beliefs through strikingly original works for the organ. With this eclectic mixture of medieval and modern, Centuries of Souls will undoubtedly be an extraordinary experience for all in attendance. Amidst all the the seasonal hustle and bustle, I encourage you to explore the vibrant musical offerings that are on display this December and January. Whether you prefer Handel’s Messiah, Tafelmusik’s The Harlequin Salon, a traditional Festival of Lessons and Carols, or any of the other listings in this double issue of The WholeNote, the richness and depth of Toronto’s classical music scene ensures that everyone has something to look forward to this holiday season. Happy Christmas, Hanukkah, Kwanzaa, Festivus and New Year – see you in 2019. Until then, keep in touch at earlymusic@thewholenote.com. DEC 8, 7:30PM: Grand Philharmonic Choir. “Handel Messiah.” Centre in the Square, 101 Queen St. N., Kitchener. A large-scale, symphonic Messiah with choir and symphony orchestra for maximum impact! DEC 15, 7:30PM: Chorus Niagara. Handel Messiah. FirstOntario Performing Arts Centre, 250 St. Paul St., St. Catharines. For those further down the QEW, this Messiah features an excellent choir and the superb Talisker Players. DEC 18 to 21, 7:30PM: Tafelmusik. Handel Messiah. Koerner Hall, Telus Centre, 273 Bloor St. W. The quintessential Messiah experience for early music aficionados – sit and enjoy the show or participate in the Sing-Along Messiah at 2pm in Roy Thomson Hall on December 22! The return of November signals a change in the world around us, as the ghosts, ghouls and gremlins of October are supplanted by Christmas cards, commercials and carols. A similar shift also takes place in the musical scene each year, with presenters and performers moving their focus from the varied programs of September and October to increasingly festive and seasonal offerings. For the early music people around us, this often means an exploration of the concerti, oratorios and choruses composed by some of the greatest musicians of the Renaissance and Baroque, as they were inspired by the Christmas story. This November is no exception, the seismic shifts of the season allowing us to hear everything from less-familiar Italian operatic excerpts to our first Messiahs of the year. On Turtle’s Back: On November 4, in St. Catharines, Gallery Players of Niagara present “Songs of Life – Bach on Turtle’s Back,” featuring a sonata, a partita and a selection of arias, all composed by J.S. Bach. This multimedia presentation is conceived by Ojibwe/Irish artist Brian Solomon and combines music, storytelling and dance in an exploration of birth, death and rebirth as connective themes of human expression. Bach himself was greatly concerned with the subjects of life, death and life after death, and these themes recur frequently throughout Bach’s works. Lutheran theology led Bach to a view of death as a relief from the struggles of life, firm in Luther’s teaching that all who trust in Christ alone and his promises can be certain of their salvation. Whether in his chorale settings, masses, passions or cantatas, Bach’s approach to death is frequently positive, peaceful, and even joyful, the reuniting of a soul with its ultimate destination. What is most interesting about Bach on Turtle’s Back is that Bach’s most potently exegetical musical settings are conspicuously avoided – there are no chorales, for example, or any other direct connections to Lutheran theology. By exploring the themes of life and death within a uniquely mixed North American context, coupled with one of history’s greatest musical minds, Bach on Turtle’s Back combines the universality of Bach’s music with the equally universal concepts of death and the afterlife in what looks to be a fascinating synthesis of music, movement, and mysticism. Sacred and Secular at Tafelmusik: Back in Toronto, Tafelmusik plays two separate concerts in November, moving from vocal drama to instrumental concerti with a Christmas theme. Their first presentation (November 8 to 11) features mezzo-soprano Krisztina Szabó and conductor Ivars Taurins in a survey of Agostino Steffani’s secular and sacred vocal music. Beginning with two sacred choral works, the early Beatus vir a 8 and the late Stabat Mater, and proceeding through a pastiche of arias, duets, choruses and instrumental movements from Steffani’s operas, this concert will display Steffani’s dual role as sacred and secular dramatist. Steffani lived an extraordinary life. In addition to being a renowned composer and a mentor to Handel, he was also a diplomat, politician, spy and priest. Steffani’s ecclesiastical status did not prevent him from turning his attention to the stage, for which, at different periods of his life, he composed a large number of works which undoubtedly exercised a potent influence upon the dramatic music of the period. Premiering his early operas in Munich, Steffani developed his skill and social connections before achieving great renown in Hanover through eight operas composed and performed at the new opera house, opened in 1689. As a rapidly rising cleric given increasingly great honours in the Catholic Church, Steffani was ultimately consecrated as a bishop; because of his high standing, Steffani published three late operas under the name Gregorio Piva, who was his secretary and assistant, to avoid breaching the etiquette required by his high rank. Approached from a chronological perspective, the Tafelmusik Chamber Choir bookends Steffani’s career in the works chosen for this concert. He wrote the Beatus vir in 1676 at the age of 22, one year after he was appointed court organist in Munich; 51 years later, after being appointed honorary president for life by London’s Academy of Ancient Music, he composed the Stabat Mater, a magnificent work for six voices and orchestra. Between these two sacred compositions will be a plethora of operatic material from no fewer than nine separate dramatic works, each of them a Tafelmusik premiere. With such skilled performers and Ivars Taurins at the helm, this concert will provide a wealth of delightful and well-done material, much of it new to many in the audience. Blackadder plays a Baroque trumpet, a valveless trumpet based on early instruments (his is modelled on a Nuremberg trumpet from 1700), capable of great ranges of expression. According to Blackadder: “The trumpet is often thought of as being perhaps the most majestic, powerful instrument of all. However, there is a much more subtle, lesser-known side to the trumpet which uses the more florid, angelic quality of its upper register to symbolize the glory of God and the heavens. This technique of playing developed throughout the 17th and 18th centuries and became highly prized by composers and their patrons alike. Court trumpeters were handsomely rewarded for their prodigious skill and were required to play at the most important ceremonies and state occasions.” Blackadder will also hold a guest artist masterclass on November 24 at Jeanne Lamon Hall, providing another opportunity to experience this renowned musician as he guides the next generation of skilled performers. Rather than being necessarily humorous, parody in music, in its Renaissance sense, meant any readaptation of existing material in new and creative ways. Composers could use their own material, as Victoria does, but they could also take popular chansons (and hide a naughty folk tune within the polyphonic texture), cantus firmus style, or use another composer’s sacred work as a starting point for their own ingenuity and craftsmanship. Palestrina wrote over 50 parody masses, and Josquin des Prez composed a number of fine essays in the form. A popular model throughout the 16th century, the Council of Trent ultimately banned the use of secular material as part of their decree to “banish from church all music which contains, whether in the singing or the organ playing, things that are lascivious or impure.” Far from lascivious, Victoria’s motet and mass are profound meditations on one of the most crucial events in the Christian year and Cantemus’ engaging and original programming makes this a concert worth hearing. Come for the villancicos, stay for the Victoria! Regardless of whether the music is secular, sacred, or a combination of the two, there are great concerts happening throughout November. From the dramatic excellence of Steffani’s operas to the sacred sounds of the Spanish Renaissance, there is something for everyone within the pages of this magazine. As stores begin to assemble this year’s window displays and the first strains of tin-can carols assault our ears, another round of seasonal favourites will be upon us before we know it. To keep up to date on all the Messiahs, oratorios, concertos, and other Baroque things happening in the city, check out next month’s column. Until then, drop me a line at earlymusic@thewholenote.com. NOV 4, 2PM: Rezonance Baroque Ensemble. “Folk of the Baroque.” St. Barnabas Anglican Church, 361 Danforth Ave. The title says it all: let your wig down and hear some music for dancing, dining and play. NOV 19, 8PM: Against the Grain Theatre. BOUND v.2. The Great Hall, Longboat Hall, 1087 Queen Street West. Something old, Something new. Hear music by G.F. Handel and Kevin Lau as AGT addresses the big issues that face our society today, inspired by stories of refugees. NOV 25, 3PM: Toronto Chamber Choir. “Kaffeemusik: The Bremen Town Musicians.” Church of the Redeemer, 162 Bloor St. W. A concert of story and song, with humorous fairy tales about solidarity among musicians paired with madrigals by Lassus, Dowland and more. NOV 30, 7:30PM: ChoralWorks Chamber Choir. Messiah. New Life Church, 28 Tracey Lane, Collingwood. Take a trip to cottage country and get in the festive spirit with one of the first Messiahs of the season.